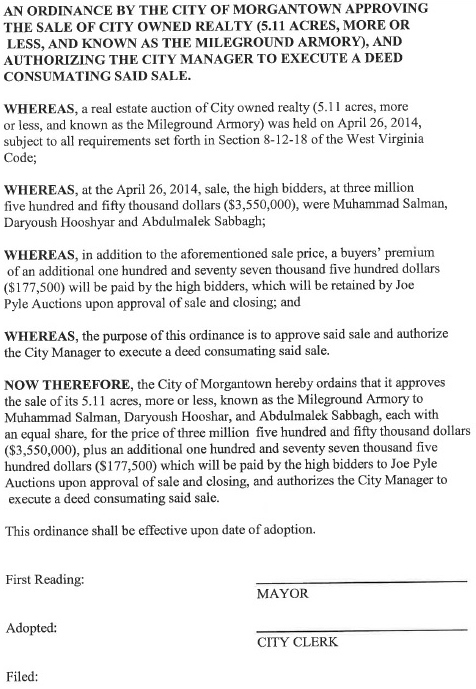 Strangely, nearly a week after the winning bid on the former Armory site on the Mileground in Morgantown, no media outlet appears to have reported who specifically won the auction or what will be done with this crucial site next to Eastwood Elementary and a major commuter corridor and roundabout intersection. 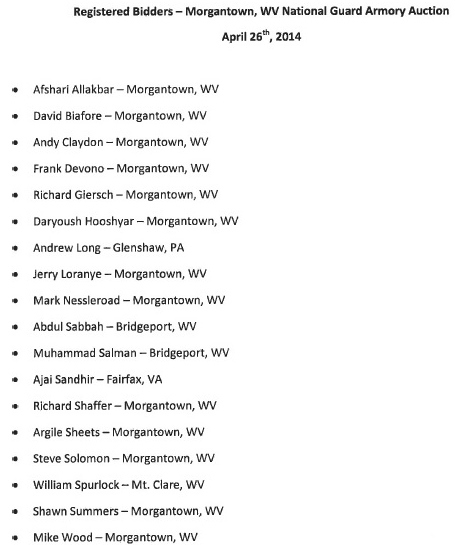 So let it be reported here first (PDF): a FOIA request shows that the highest bid went to a West Virginia trio of two doctors and one housing contractor: Dr. Muhammad Salman and Dr. Abdulmalek Sabbagh of Bridgeport, and Daryoush Hooshyar of Morgantown. Dr. Salman is a psychiatrist, Dr. Sabbagh is a cardiologist, and Daryoush Hooshyar is a housing contractor. What do the doctors and contractor plan to do right beside Eastwood Elementary and the major roundabout intersection? What were the second and third highest bids? 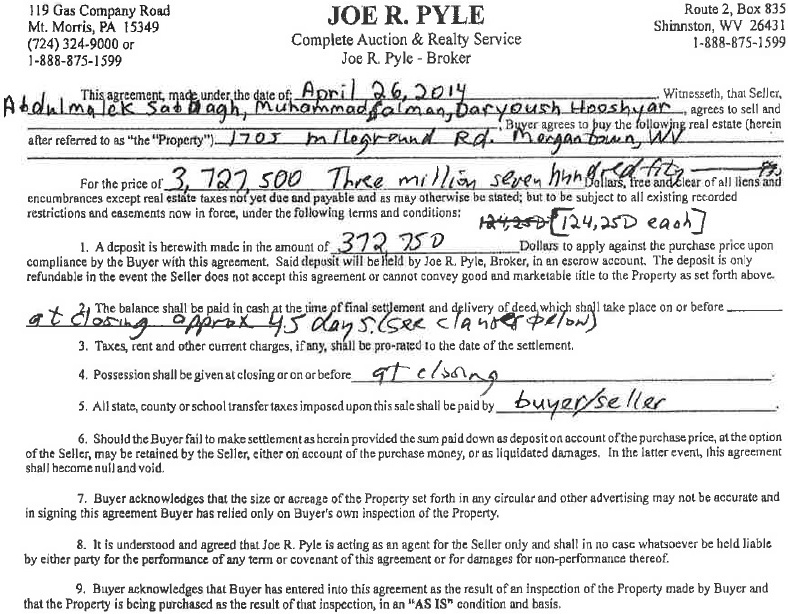 What price, what persons, and what intentions, and would they be more beneficial to immediate concerns of the school and traffic than the highest bidders’ intentions, whatever they may be? The public remains absolutely in the dark and totally vulnerable as to what the 5 acres immediately adjacent to the elementary school and roundabout will become. The city ordinance to be read in a few days would seem to allow these buyers to install most anything they like, a gambling joint, gas station, mega housing complex, whatever, or to simply change their minds and immediately turn around and sell the property to…any unknown enterprise potentially threatening to the school and commuter corridor and intersection. Why shouldn’t these men or their representative appear before council and testify to their intended use of the property? Furthermore, they should be pressed for actual site and management development specifics, especially in light of the adjacent school, also roundabout. Finally, shouldn’t the ordinance be amended as far as possible to specify or mandate the particular use of the property as far into the future as possible, or at least include some specific “good faith” language, as much as possible? Lacking some significant semblance of the above, the approval of the sale should be held up indefinitely. To do otherwise would be to put negligently at risk not only the school but also the commuter corridor and major intersection. The public needs to know what they might be in for before the city council would approve its sale of the former armory site. To best serve the public, the development intentions behind the top three bids should all be considered. 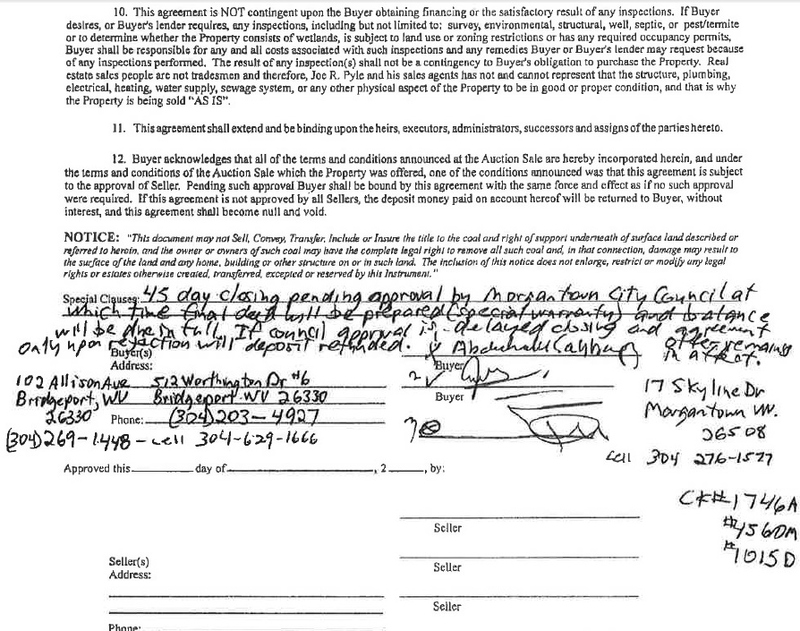 The information included below is found in the armory site auction FOIA PDF. « Meth Is A Go In West Virginia!